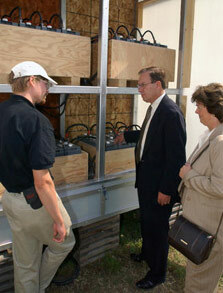 A student from the University of Colorado discusses his team's battery system with visitors Senator Wayne Allard (Colorado) and Joan Allard. Most of us live in houses powered by energy from the utility grid. The Solar Decathlon village will be a "stand alone" village, powered by the solar electric (also called "photovoltaic" or "PV") systems on each of the teams' houses. While the sun shines, the PV systems produce electricity, and the teams will use battery systems to store that energy for the nighttime and any rainy days that might occur during the competition. The Energy Balance contest requires teams to use only the energy they generate during the competition to provide all of the electricity for the contests. Teams earn full points if their battery systems have as much stored energy at the end of the competition as they did at the beginning. The teams that can achieve this prove that their PV systems supplied as much electrical energy over the course of the competition as the teams used to power everyday life! And, of course, all of that power came from the sun. Energy Balance will be scored by measuring the amount of energy going into the batteries from the solar electric system and the amount of electrical energy being drawn from the batteries to meet the houses' electrical needs.